"When I think of Bob, I think of dedication and leadership," said Brett Wood, president and CEO of Toyota Material Handling North America. 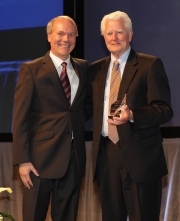 "Bob is a shining example of leadership in his business, his community and his industry. He has contributed immensely to Toyota's success and to the material handling industry." Hull has been in the Toyota lift truck family for 20 years and is an 11-time recipient of Toyota's President's Award, which honors the top 20 percent of the dealer body, recognizing them for demonstrating excellence in sales, parts, service, customer satisfaction and overall dealership operations. Today, Hull Lift Truck, Inc. serves its customers from five locations in Elkhart and Fort Wayne, Ind. ; and Benton Harbor, Battle Creek and Grand Rapids, Mich. The company was established based on the customer service philosophies of Robert Hull's late father, Edgar Hull, who 50 years ago, in 1962, founded Hull Lift Truck, Inc. with two employees in a modest single office garage in South Bend, Ind. Bob Hull led the initiative to become a Toyota Industrial Equipment dealership in 1992 and continued to serve customers in northern Indiana and western Michigan. Like his father, Hull transitioned the business in 2005 to his son, Brian, who currently leads the dealership. Hull resides in Granger, Ind., with his wife of 50 years.